The San Miguel Beermen spared no expense in handing the Rain or Shine Elasto-Painters a rude awakening in Game 4 of their 2015-2016 PBA Philippine Cup semifinals series. SMB rebounded from back-to-back losses by dominating ROS to square their series at two games apiece, 105-92. 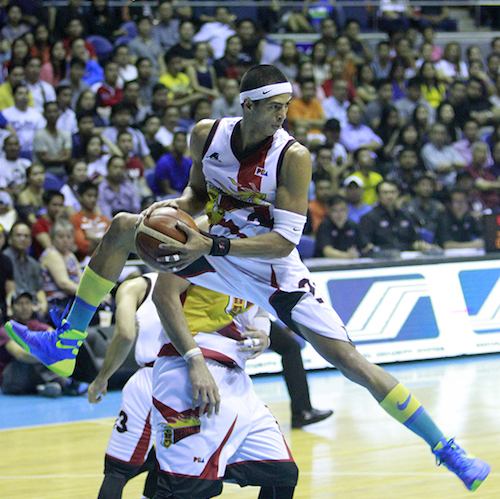 Arwind Santos and the Beermen bounced back in a big way in Game 4. San Miguel’s reigning back-to-back PBA MVP June Mar Fajardo had another huge game, but he didn’t have to do it alone as the Beermen blew out the Rain or Shine Elasto Painters, 105-92, in Game 4 of their SMART BRO PBA Philippine Cup semis clash on Monday at the SMART-Araneta Coliseum. Fajardo, who was averaging 38 points and 18 rebounds in the series, had a slight dip in performance – by his lofty standards – as he finished with 33 points, 15 rebounds, and 6 blocks to lead the Beermen. He had, however, some great support from his teammates in this one, led by Marcio Lassiter and Arwind Santos. Lassiter finished with 20 points, including a perfect 4-for-4 from beyond the arc, while Santos had 19 points and 8 rebounds. Chris Ross added 13 points and Alex Cabagnot chipped in with 12 in the victory, which allowed San Miguel to tie the best-of-seven series, 2-all. Bench players and fellow rookies Maverick Ahanmisi and Don Trollano paced the Painters with 15 markers each, while Jewel Ponferada dropped a baker’s dozen. Rising stars Raymond Almazan and Jericho Cruz both missed the game due to injuries. RT @thepbaologist June Mar Fajardo's 147 pts 71 rebs & 16 blks are unprecedented totals for a local in 1st 4 games of a PBA playoff series.